We just stumbled across a deal that was so good we thought we should share it. The web hosting company that hosts EverythingEtsy.com and pretty much all of our other sites is having a 50% Off Cyber-Monday Sale. We just happened upon it or would have posted about this earlier, but for the next ten or so hours (ends Monday at midnight eastern) you can buy a year of web hosting for $41.76 or three years for $89.28! I still remember our very first web-hosting bill back in 2008 and I remember we paid more than $100 for just one year, so this really is a very good deal. If you’re interested in learning why we think this is important for Etsy sellers and bloggers, read on! When you started your Etsy shop, did you get this little flutter of excitement inside at the idea that you might sell “hundreds or even thousands” of your items? Did you harbor this little quiet, almost unspoken, hope that you could maybe make some “real money” selling online? That you could make a living doing something you love to do? We really don’t like to sound anything like those “make money online now” scams and we know they say some of these same things. But the truth is that the potential is very real and very much there, right now. Today. Tim used to be a remodeling contractor. We owned a company with lots of trucks and workers and jobs going on all over town. We NEVER would have guessed that a few years later we would be spending most of our time working on blogs, and writing, and Etsy shops. But here we are. Our entire living is now made through our laptops and a decent Internet connection. The first step for us was to start an Etsy shop, the next step was to start a blog on our own domain. Then we just kept working at all of it. It’s really a longshot to try to reach any level of real success online without having your own website/blog on your own domain. Besides, it’s so cheap. Why wouldn’t you do it? It’s a busy time of year. Probably not the best time to try and learn something new. If you’ve never used WordPress before then you’ll have a little learning curve to get started. Not much, but a little. But you don’t have to adhere to any schedule or timetable for your learning. Set-up your account while it’s half-price and start on it January 1st! There is no reason you have to deal with it today. There is a saying, and it’s another one of those cliche’ type things we would avoid if they weren’t so darn true. “Content is King.” The success of your website is going to be ALL about how compelling, interesting, and useful you make the stuff on your pages, the content. It’s all about the content. Lots of people start websites and worry right away about what they look like. Sometimes they put tons of effort and money into getting a site to look pretty only to be frustrated a few weeks later because nobody is coming. You’re better off with an ugly website with great content than you are with a pretty website with nothing of value. So don’t waste your time and money trying to get the “look” perfect right away. Stick with the default WordPress theme for just a few weeks at least while you learn how you’re going to use your website. If you already have a domain name registered, you can buy the hosting account without the domain name. Then you go to your domain registrar and “point” the domain to your new hosting account. If you don’t yet have a domain name (such as Etsypreneur.com) you’ll have the opportunity to buy one during the set-up process. They’re on-sale today too for $1.95! Try to get the same thing as your Etsy Shop name. .COM is best, .NET is good too. There are also other options but if you can, I suggest you try to get a .com. You can use hyphens in the domain name if that helps. If you find a domain name that you like that is different than your Etsy shop name, look to see if you can get the username on Etsy. It’s best if they can match, but if not try and pick a domain name that’s easy to remember and hard to misspell. Normally I would suggest the “Baby” plan because you get unlimited domains, but at these prices the “Hatchling” plan is so cheap that I think that’s the way I would go, but either are great deals. When you complete the sign-up process, you’ll get a welcome email that gives you access to your cPanel. It can look a little daunting at first, but it’s really very easy to use and the Hostgator support area is excellent. They also have great email and phone support available 24/7 if you need any help. WordPress is without question the best way to go for general purpose use that will include a blog. 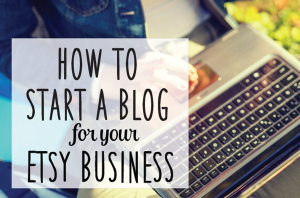 You definitely want to include a blog. WordPress setup is so easy. The hostgator support forum has easy to follow how-to videos. 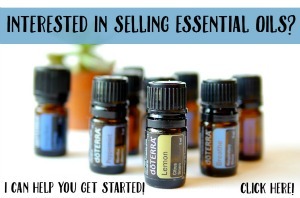 You don’t have to figure it all out at once! Tim spent the last week solid learning new stuff about the workings of the Internet and our websites. That’s after four years! The point is that if you let what you don’t know stop you, you’ll never get started on this road. And it is a good road to go down. You know you want to increase your success online. You know that having your own website and/or blog can help that. You know it’s cheap to get a website online… just a couple bucks a month! You know that the Internet is full of helpful information and tutorials. You know how to use Google, or Bing, or Yahoo! You know what happens when you think an idea is worth doing but you procrastinate…time slips away. We didn’t start writing this with the intention of making it so in-depth, but we really think this is a great deal and can’t think of many better New Years Resolutions than to start blogging to build your business. 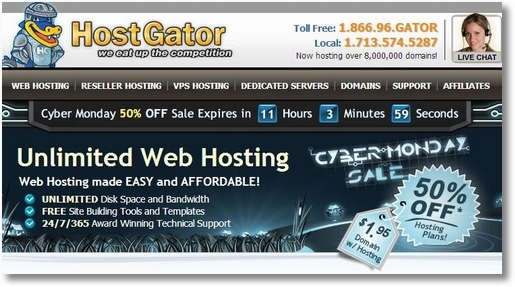 So go to HostGator and take advantage of this 50% off Cyber-Monday sale! Disclosure: When we switched our sites from Bluehost to Hostgator, we signed-up for the Hostgator affiliate program so we’ll get a referral bonus from Hostgator if you sign-up using our links above. It’s a win-win-win. Thank you!